I haven't written about any books recently. 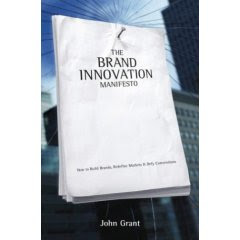 One I've been meaning to mention for a while is John Grant's Brand Innovation Manifesto. This must be one of the most interesting marketing books I've read. This is a book about new marketing. About how image marketing is no longer valid for many brands. About challenging old branding models. I contacted John soon after finishing this and persuaded him to come and do a few workshop sessions with my colleagues in Dublin. It is bursting with case studies and examples. I cannot recommend this book enough. If you like it, read his After Image too.